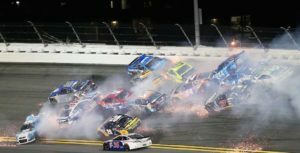 (NASCAR)—Joplin driver Jamie McMurray helped start “the big one” in the 400-mile race at Daytona and Columbia’s Carl Edwards couldn’t avoid a late-race smaller crash, leaving both with disappointing finishes in the traditional July Fourth holiday weekend race. McMurray appeared to move to a lower lane on the first turn of the 91st lap and Jimmie Johnson’s car touched his left rear quarter panel, sending him into the wall and triggering a massive pileup that involved more than half of the forty cars in the race. The crash was especially damaging to McMurray because his 34th-place finish drops him out of contention for the ten-race championship run that will end the season. McMurray is now 16th in points and although the Chase allows sixteen competitors, McMurray is on the outside looking in because does not have a victory this year and Tony Stewart does. Stewart’s win at Sonoma the previous Sunday will put him in the chase if he finishes in the top thirty in points. Although he, too, crashed late in the Daytona race, his 26th-place finish gave him enough points to climb into 30th place in the standings after missing the first eight races of the season with a back injury. McMurray is four points behind rookie Ryan Blaney, the last non-winning driver eligible based on points. 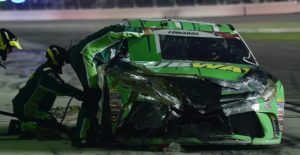 Edwards, who has never won a restrictor plate race (NASCAR restricts the horsepower cars can generate when running the high-banked tracks of Daytona and Talledega), started second, led the first eight laps, and was running in the top ten all night. He was running ahead of McMurray and the 21 other cars involved in the big crash on the 91st of the 160 laps in the race. But Edwards was caught up in a four-car crash with four laps to go. He was able to get his car to pit road, although he drove in from the exit end of the pits. There wasn’t enough left of his car to repair it for the last laps of the race. He finished 25th. He already has two victories this year and is third in the Chase standings. The race was the 17th of the year. Only nine races are left to determine who will be the sixteen drivers starting the race-off for the championship. (INDYCAR)—IndyCar was off for the holiday weekend but resumes racing next Sunday on the high banks of the Iowa Speedway. (INDYCAR/NASCAR)–Bulldozers are moving dirt inside the third turn of the Indianapolis Motor Speedway as a retirement gift for Tony Stewart, an Indiana native who started the 1996 race from the pole and who won the 1996097 IndyCar season championship before moving to NASCAR. Stewart has won NASCAR’s Brickyard 400 twice (2005, 2007). Speedway President Doug Boles says the 3/16th-mile oval will be ready for Stewart’s media appearance Tuesday. Reports indicate several owners of dirt-track midgets will take part in an exhibition race. Boles told the Indianapolis Star last week, “Tony doesn’t want gifts, per se, but we thought this was a great way to marry his love for dirt-track racing with his love for racing at the Indianapolis Motor Speedway.” The track will remain although Boles does not expect IMS to be holding a lot of dirt-track races. But there will be some “from time to time.” The area is usually used for infield parking for the Indianapolis 500 and the Brickyard 400. It will still be available for those purposes. The Brickyard 400 will be Sunday, July 24. (FORMULA1)—Lewis Hamilton and teammate Nico Rosberg collided again while fighting for the lead in a race, a shut that Mercedes team boss Toto Wolff called “brainless.” Rosberg, who was having some brake problems, had the lead on the last lap of the Austrian Grand Prix when Hamilton tried to pass on the outside of the second turn. Rosberg turned late, hit Hamilton’s car, and damaged his car’s front wing. Hamilton went on to win. Rosberg finished the race fourth, the wing stuck under the front of his car, falling behind Max Verstappen and Kimi Raikkonen. Rosberg’s points lead over Hamilton has shrunk to only eleven. Hamilton was booed by the crowd during podium ceremonies. Rosberg said afterwards Hamilton should have given him some leeway since he was on the inside, “so I can dictate.” Rosberg said he was surprised Hamilton turned in and blamed him for the collision. Reporter Daniel Johnson, writing for The Standard, reports Mercedes officials are considering telling Hamilton and Rosberg not to race one another after a certain point in next week’s British Grand Prix at Silverstone. Hamilton and Rosberg took each other out of the Spanish Grand Prix with a collision in May.